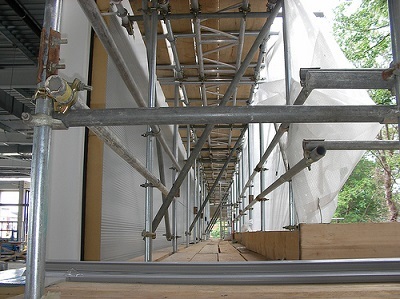 Are Metal Scaffolding Platforms Ideal For Routine High Rise Building Maintenance Undertakings? Getting high access structures and buildings maintained on a regular basis often pose a great challenge. Since things such as windows are located high up, they are often difficult to reach from the ground. This being the case, it often becomes tedious, dangerous and disturbing when trying to reach them. But with the help of the today’s innovative metal scaffolding technique, it is quite possible to reach, clean and maintain the most difficult spots on or in a building. The utilization of acrow props and scaffolding platforms has become increasingly popular in the past few years in the high rise building maintenance industry, and for a good reason. People have realized the importance for secure and safe working settings. We often hear about fatal situations in the building maintenance arena, sometimes even in the construction industry, and which can all be avoided with the proper scaffolding safety standards and measures. When should you consider using scaffolding? While there is a wide range of ladders available in the market that can be opted for when it comes to reaching high places in a building, often these are not the safest of options. So before thinking of using a ladder during your maintenance undertakings, ask yourself the following questions. •	Is the nature of maintenance convenient or comfortable for ladder use? •	Do I have to move the ladder from one place to another several times an hour? •	Am I going to move heavy equipments or materials up and down frequently? If the answer for the above three questions is a strong yes, then it is evident that your need a scaffolding. In this case, consider purchasing this tool the earliest time possible so as to be able to carry out your maintenance in the safest, seamless and convenient manner. •	Since they free standing, they do not need the support from any external materials making them an excellent choice for high rise building maintenance programs and construction sites. •	Scaffolding offers the convenience and flexibility to perform risky tasks with ease and without any fear. •	These towers are exceedingly easy to set up, install and also move from one place to another. •	There are many instances when it becomes impracticable to try and reach some areas or positions on your high rise building without the assistance of a scaffolding platform. Basically, this tool makes the whole undertaking simple and easy, if not convenient. •	Scaffolding is considered as one of the most reliable and efficient tools when it comes to rendering the industrial standards and protection measures. It keeps you and others involved in high rise building maintenance projects safe and well protected from unnecessary mishaps. Scaffolding towers or platforms are used in areas such as high rise building’s window cleaning tasks, painting, civil engineering, construction inspection and examining, maintenance and repair undertakings, etc. this being the case, it is clear that scaffolding is utilized in a wide variety of sectors for reaching elevated spots that are difficult or impractical to reach with a standard ladder.